I eat food, and sometimes I cook it. I watch TV shows and read magazines about it. I even order it when we go to restaurants. I was an aspiring food enthusiast and home chef for a couple of months until I realized it’s hard, and kind of a lot of work. It can also be pricey if you don’t know how to do it right, and even pricier if you do. I think I’ve read and collected a thousand recipes in an attempt to lovingly categorize them and store them in these super-cute graphic-print 3-ring-binders I found at Target. I spent hours in front of DVR’d episodes of CSI: Miami, arranging the recipes in sheet protectors and everything. 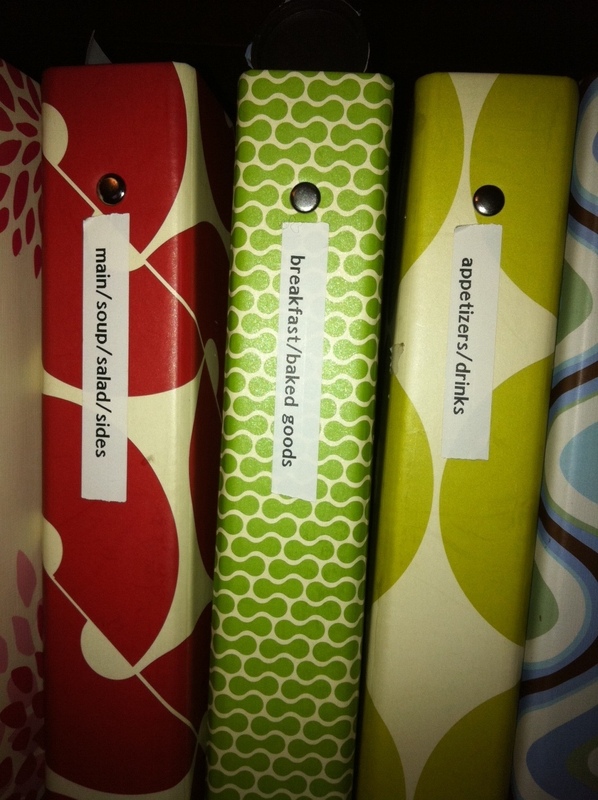 For a while I thought that yes, I would absolutely make every recipe in these binders, and I would jot down little notes about whimsical on-the-fly substitutions and possible wine pairings. The pages would be dog-eared and splattered with homemade tomato sauce when I would, in my old age, hand them over to my boys. The boys would of course accept them with reverence and a touch of awe. It did not take me long to accept that this would not likely happen. My binders, as cute as they were, were not grounded in reality. Nowhere in my binders had I lovingly clipped and mounted the instructions from the side of the macaroni & cheese box or Trader Joe’s fish nuggets. There is the strong possibility that it might actually be the binders and the sheet protectors that I love, and not the 40 recipes I have for mushroom soup. Perhaps my boys will accept the binders one day with reverence and respect for my one-time love of organizational systems. I set about to make my collection useable. Out went all the recipes that required fish sauce, quinoa, lamb, curry, eggplant, shellfish, whole fish, or whole chickens. Also the ones where the food would need to rise, rest, or take an ice bath. The food could not at any point be required to look like pea-sized gravel, as this usually requires a food processor or a stand mixer…my great white whales of kitchen appliances. I know what my family will not eat. They’ve vetoed polenta, fresh tomatoes, and if it were up to Zach, anything that is not “noodles with butter.” There are some dark moments in my culinary past that have made me gun shy enough to disqualify even more recipes. Fried chicken is out, and I don’t want to talk about that batch of sugar cookies. If you’re interested, John will happily recount the tale of the “ham ring” from our first year of marriage. We threw a dinner party years ago. I was at Whole Foods ordering a $100 piece of meat, I think a standing rib roast. I asked the butcher so many questions about how to prepare it, that he came out from behind the counter to give me a hug and tell me that everything was going to be ok.
Over the years, the cool ingredients spent time in everybody’s pantries. Pine nuts. Sun dried tomatoes. Feta. Endive. Leeks. Wild Boar. (No? That one didn’t make it? Shocking, the weird meat with the three-day aftertaste was sure to be a winner.) Aioli. Truffle oil. Yes, I know these are still around, but each enjoyed their 15 minutes as the darlings of California Cuisine. I’ve been to many a farmer’s market, but have been known to find the experience so completely overwhelming that I will leave with nothing more than a sausage sandwich from the sausage guy. So if I’m not a foodie, what am I? a bookie? That doesn’t sound good. A wordy? Um, I suppose that already applies, especially if you’ve made it this far into this post. I like TV – how about a showy? A winey? Let’s see what we have so far: a showy, winey, wordy bookie. Perhaps I’ll dust off the binders and give foodie another shot. We all know where good intentions take us…the drive thru! Thx for reading and dropping a note! You, my dear, are indeed a foodie. Don’t let those Martha Stewart types tell you otherwise. A foodie is simply one who thoroughly enjoys good food and appreciates everything that goes into preparing it. We may not all be capable of making the perfect hollandaise or Caesar salad, but we know a good one when we taste it! That’s all that matters. Go! Eat. Be happy! Hahaha! You are too funny! I do appreciate a good Caesar. I was actually thinking about that one dinner at your house years ago – the one where I learned what a ramekin is and where you made souffle. Yeah – that put you into a different stratosphere of foodieness for me 🙂 thanks for taking the time to read & for dropping me a note. Are you reading this poolside somewhere? lots of love! But, so is quinoa. Really. It’s how I sneak more protein to my toddler–throw it in the rice cooker with white rice. I want to talk more about this! Sent you a FB direct message. Hugs! Oh my gosh – you know I’m a fan of you and your menus. I absolutely picture you stress free in your happy kitchen coming up with brilliant recipes while your little girls clap for you! I got your message & am so excited to talk more! thanks for reading Tamiko – you are a super woman. Thanks for sharing. I laugh because I have a dear friend who photographs all the food she makes. One part of me is “how cool – look at what you’re making!” One part is, “Really?” and the other is “How do you have time to click pics?” I don’t think anyone wants to see my pics of a destroyed kitchen after Tuesday tacos…not pretty. We’re moms, and gosh darn good ones. Clip the coupons – we can save them for old age! Hahaha! I love that! Now I am picturing what a photo of dinner prep at my house looks like – so many boxes!! I read somewhere that restaurants in SF, NYC, LA are banning people fro taking pix of their dinners because it’s becoming so disruptive to other diners. People getting out of their seats for good angles, etc. You are so right, we should be happy dinner is getting on the table. You are not just a mom but a great fun engaged mom, who also happens to be a teacher, smarty pants, cultured woman of the world. Those are some lucky kiddos! Thanks so so much for reading & dropping me a note. It cracked me up. I just saw that the ping-back needed to be approved! I didn’t know that….so it’s just been sitting there – so sorry Kikugirl! Colleen..my favorite dinner?? Microwave popcorn, cut up apple slices, string cheese and maybe some hot chocolate. I think I’ve covered all the food groups! Yum!! Miss you pretty lady…hugs to you all!